Constant movement of since I left nearly 10 months ago on this round the world trip has finally caught up with me. My time in Europe these past weeks has been an opportunity to slow down and sink into a slower pace of travel. Instead of racing through sights as I did in Southeast Asia, I am keen to find unique towns and cities and then delve deeply into that one place. It’s a practical way to combat the weariness creeping into my days. Which is how I found myself with many weeks to hunker down in Amsterdam and “live like a local” during a housesit where my only job was to feed a cat and bike the streets of Amsterdam to my heart’s content. Getting to Amsterdam was a bit of a debacle. Český Krumlov in the Czech Republic charmed me in every way. Although I had intended to stay a couple of nights, I cozied into a cute hostel and stayed for a week while I ate my face off and rafted down the Vltava River. When it was time to leave, I booked a flight—the trains prices were Europe expensive since we hadn’t booked ahead, the difference was a 50 euro flight versus a 135 euro train ride. My cousin and I hadn’t bought a rail pass this time, so the flight was the better deal. The day before our flight, I realized that I had booked the wrong day. Since it was an extra day rather than a day sooner, my cousin and I didn’t miss our flight, thankfully! After a scramble to book another night at our hostel, I knew it would be nice to settle into one place for weeks and dispense with the time-consuming travel planning aspect of a round-the-world trip … at least until it was time to move onward to the UK! Amsterdam. What a gorgeous city and a true treat that my cousin had a friend who just-so-happened to need a house-sitter so she could visit family in the states over summer break. In exchange for feeding her two cats we had: two bikes, a gorgeous flat, two museum cards, and the opportunity to truly dive into Amsterdam and travel the city like a local. The house-sitting flat served as homebase for my time living like a local in Amsterdam (Update 2018: Airbnb would offer a similar experience now, although it didn’t exist yet on this trip). After 10 months of eating at restaurants and cooking in hostel kitchens, Amsterdam’s incredible farmers’ markets were precisely the boost I needed. During the summer, fresh fruits and locally-grown veggies fill the markets—and there’s a farmers’ market scheduled nearly every day of the week! Juicy red currants had just come into season when I arrived in late July and they graced my breakfast every single day. Other gorgeous carrots, beans, zucchini, and tomatoes made for a delicious chili one night. And the beautiful veggies and fruits were just one reason to enjoy the farmers’ markets: it’s also the best place to find locals. I ultimately spent much time uncovering the best things to do in Amsterdam as a traveler, and the food aspect is one of the best ways to actually see what it feels like to live in a city. Few Dutch people eat in Central Amsterdam every night of the week—instead they shop for food, cook, and enjoy the bounty of locally-grown foods. So, around all of my time exploring Amsterdam, I cooked my meals and ate like a local whenever possible. Then it was on to using my newfound bike, museum card, and local tips from friends to dive into the city one step at a time. Rent a bike and navigate Amsterdam like a pro. Amsterdam has a reputation as one of Europe’s most progressive cities. And while a lot of that reputation comes from the “coffee shops” selling a range of legal consumables, there’s so much more to the city. The biking culture is strong, in fact it’s beyond strong—with absolute support from the government Amsterdam has a phenomenal network of safe bike lanes that, in may cases, are given priority over cars. Biking around Amsterdam isn’t just safe, it’s practically required if you want to travel the city like a local. My friend left me an old jalopy of a bike of putter on through the streets as I explored the museums, parks, and markets. With weeks on my side, my bike and I explored all the nooks-and-crannies that I could find in the city, and I whittled down the list of things to do in Amsterdam to my core favorites—those things that you could feasibly visit with just a few days, in fact. Because although I loved deeply exploring, that’s a lot of time for most travelers and Amsterdam is often just a stop along a longer backpacking trip through the city. To properly undertake the next steps, you need to rent a bike in the city. It’s not only the preferred transport for locals, it’s faster and way more fun than either walking or public transport. There is no shortage of bike rental companies, so pick one near your accommodation. Once you’ve rented a bike, ease yourself into learning to navigate. There are rules to the road here, and biking is pretty serious—locals whiz past at top speed and the bike lanes have their own traffic lights, too. Don’t let this scare you away though, because the city’s streets are designed to accommodate a lot of bike traffic and bikes have the right of way. When my friend took me around the city before she left for the states, she pointed out the most commonly misunderstood bike riding rules. Cars yield to bicycles but buses and trams do not yield—you had better GET OUT OF THE WAY asap if you’re in the path of one barreling down on you. Just as you’d expect, the red bike lanes run alongside major roads and work just like roads—you bike on the right side of the street with the flow of traffic. Bike traffic signals rest at eye level at every intersection, and you know it’s your signal because the lights are in the shape of a bike! Call me lame, but this delights me. 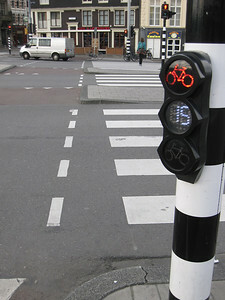 I quickly learned that you must only use the bike signals right next to you, not ones across the intersection (picture the screeching and squealing of car tires as I figured that one out!). Anyhow, you will grow to love your rented bicycle and you can rest assured that locals will help give you wide berth—tourist bikes are painted bright yellow and red and locals stay well clear of floundering newbies (I didn’t have that benefit on my crusty-rusty bike). Once you’re at a stop, lock your bike securely. Truly, pay attention. The couple that I was house-sitting for had me using the jalopy bike because of the high rate of bike theft. Locals secure every part of their bikes and I had to use between three locks on the bike every time to ensure its safety (one each for the frame, tire, and seat). So, you’ve secured your rental bike and now everything that you could possibly want to see in Amsterdam is bike-able—from the Museum complex to the Anne Frank House to the Red Light District). By renting your bike you’ve now parted with the only money you’ll send on transportation until you need to leave the city. Spend the morning lost in Amsterdam’s best museums. There are roughly 26 museums and/or places of interest in the city (and there’s a great free-map at the tourist office/museum information desk). Another score for the house-sitting hookup was a museum card that I could use to my heart’s content. Although I visited most museums, including the obscure ones, the two most obvious and well touristed are solid—that’s why they’re so well touristed! You have to visit the Rijksmuseum and the Van Gogh Museum. The Anne Frank House is also unskippable. And a heads up: the EYE Flim Museum and the Theatre museum are skip-able unless you have loads of time and an incredible interest. The Van Gogh Museum is worth every penny of a visit and it would be a crime to scrimp and skip it. It’s a phenomenal museum, even on a repeat visit like mine. 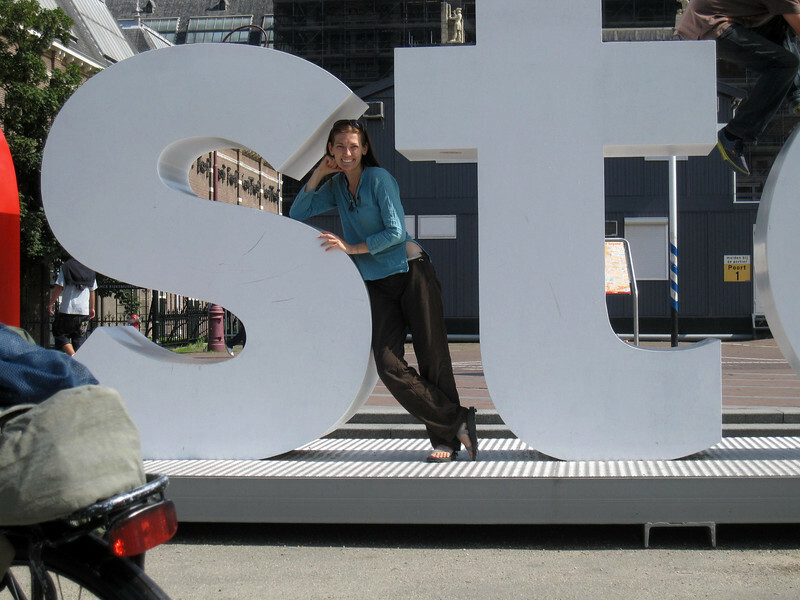 I was in Amsterdam during a college-era backpacking trip and I also paid a visit. The museum is larger now and seems to have even more exhibits, each showcasing masterpieces from Van Gogh and his contemporaries. The works chronicle Van Gogh’s life, and other stunning artists on display include Paul Gauguin and Emile Bernard. There’s also an interactive exhibit on one of the upper floors for those wanting to get in touch with their inner geek (read: me) and learn more about the restoration process—it details how they even know these paintings are actually authentic Van Goghs! And I cannot leave out the Rijksmuseum, which has some amazing silver work the likes of which I have never seen, in addition to china and various objets d’art. All told, it’s a different experience than the Van Gogh Museum, where it’s all about looking at paintings. Here, there is a good deal of variety as you wander rooms and exhibits. If you’re on the fence about visiting, just go and spend however much time you want looking at it all. Any pressure to whole spend the day there is entirely internal, because you can just wander and find pieces that strike your fancy, and then keep going. After months on the road, I’ve learned to let go of anyone else’s expectations of how I should travel, and instead I enjoy a few hours of art and culture, then I like to head back outside and find something else to do. Skipping some and focusing on what catches your eye will take some of the chore out of visiting museums—if Amsterdam is part of a larger European trip, start with moderation or you’ll just burn out. Visit the markets and eat all of the things! For foodies, there is nothing more delightful than Amsterdam’s gorgeous organic food markets. I was lucky to stay in a place with a fully stocked kitchen so I could cook a feast. But backpackers with a hostel kitchen, or hotel travelers with a mini-fridge, can also take part by buying fresh fruits or items for a picnic lunch in the park. Amsterdam is a progressive, green city at the forefront of the movement to make cities green and increasingly live-able. And you can feel it at every level of life when you’re in the city. In addition to biking around the city instead of cars, locals have a huge selection of fabulous outdoor food markets. While I am the first to rave about the exotic treats you can find on the streets of Asia’s; just because the city is Western doesn’t mean you should skip the markets! A wander through the local bustling markets is just as enlightening to the culture of the Netherlands as it is when strolling around Luang Prabang, Laos. I wandered through the stalls, took in the crisp scent of every vegetable imaginable, and marveled at the rich selection of fresh, in-season produce. Instead of buying Washington apples shipped from the US’s Pacific Northwest, local farmers sell juicy blueberries, currants, and other seasonal delicious, delights. It’s not only an eco-friendly adventure, it was a lot of fun, too! Interacting with locals, however, remains the best reasons to wander through daily and weekly markets. You can never truly know a place until you talk to the locals and embed in the daily routines. Even on a short trip to the city, the markets are a great place for trading dialogue and a bit of shopping fun while picking the perfect apple for your afternoon snack. Nearly every person in Amsterdam speaks English and if they started speaking in Dutch, I just asked for English and they flawlessly switched languages. Beyond seeking fruits and snacks in the markets, cooking a feast using the local ingredients is a great way to feel like an authentic part of Amsterdam, after all, the locals don’t eat out every night! My friends and I cooked a feast in Italy using fresh local pasta, fresh organic tomatoes, and top-quality olive oil—it grand fun to shop around and dodge locals picking out their weekly produce. The same holds true for Amsterdam—pick out gorgeously fresh veggies, pop into the local bread shop for fresh bread, and cook the city’s best flavors. And just for fun, one fun find at a huge flower market was Cannabis seed starter packs. It’s just one of those things that you’re likely only going to see while wandering the streets in Amsterdam really and it cracked me up. Talk about getting some local color! Pick a park or day trip and enjoy a picnic lunch. What ultimate guide to Amsterdam like a local could be complete without including one of the top ways locals relax: with a picnic in the park! The city has many green spaces, and most are tourist-free and filled with locals, kids, and pets. Alternatively, locals are just as likely to head outside the city on a day trip to any of the many nearby and fascinating cities/sights. Both are equally incredible, but the park is easy for those on a time crunch since you can easily combine it with a visit to the nearby museums. To truly feel like a local in Amsterdam, you have to relax and take it slow enough to destress and truly soak in the sunshine and fresh air. In addition to legal “coffee shop” purchases, open container laws are lax here—a stark contrast to the United States—so you can enjoy a bottle of wine, cheese, and bread while relaxing. One of my favorite days in Amsterdam when I spent an entire afternoon reading and snacking in Vondel Park. For visitors already renting a bike to explore the city, the trip to Vondel Park is a cinch—it’s extremely close to the Rijksmuseum and the whole museum complex. There is a delightful little bread shop and grocery store on Overtoom (on the left side of the street if coming from the train station side of town). This street is just around the corner from Vondel Park and the bread shop has the freshest bread in the city according to my local friends (it was pretty tasty!). Whenever I needed a break, I would peddle to this small market, lock the bike up tight, and go on a mini shopping indulgence. Although I could wander the shop for a very long time, I instead picked out a loaf of bread, chose a temptingly expensive chunk of exotic cheese, grabbed a bottle of wine, and headed lakeside at Vondel Park to people watch. Where to stay: Use Airbnb to find the local flats where you can either rent a room in a local’s flat, or have an entire place to yourself. Many of these places are a bit outside the city-center, but they are close. If you’re keen to be in the think of things, Booking.com is my go-to for assessing hotels and hostels. Getting around: I truly recommend renting a bike to get a feel for the city. Although the public transport is great, locals use the bikes in masse and it’s just easy. You can also rent bikes with kids seats or larger attachments that can hold 2+ kids in an attached doohickey—basically there are few reasons you shouldn’t rent a bike. But if you’re in need of other transport options, download the Uber app—it’ll get you anywhere you need to go and you’ll save a few bucks on your first ride. Travel insurance: Travel insurance is essential for any trip, and I have never traveled without it. Although biking in Amsterdam is safe, because you won’t instinctively know the biking rules of the road like a local, there are inherent risks. Take cautions and be prepared by insuring yourself. I use World Nomads and IMG, depending on the trip (here’s how I decide which travel insurance is right for my trip). Additional tips: High season in Amsterdam is busy. There is very little affordable last-minute accommodation throughout the summer, so plan your trip months out if you hope to find the best hostels, private rooms, or even rental flats. Activities are easier to plan at the last minute, and you can easily either explore solo or find local tour companies offering sightseeing tours not only in Amsterdam, but to surrounding areas of the Netherlands, as well. And don’t forget to bring a European plug adapter so you can charge your electronics!